Pundit Live Array Pro – the first pulse echo array system incorporating artificial intelligence. 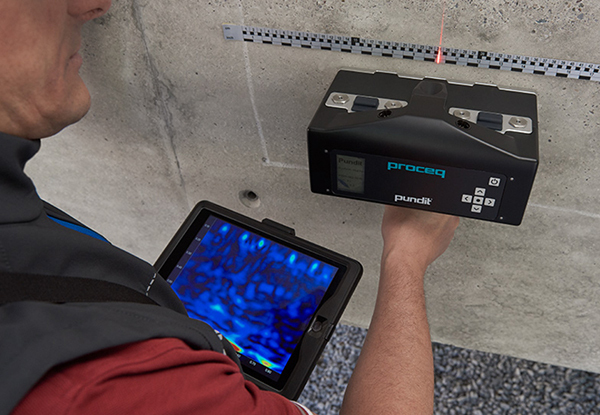 Ultrasonic Pulse Echo testing is ideal for thickness measurements of concrete elements, the localisation of defects and for detection of objects in conventional or steel fibre reinforced concrete. It has also been used to evaluate the grouting of post tension tendon ducts and to confirm left in place form work is correctly filled with good consolidation. 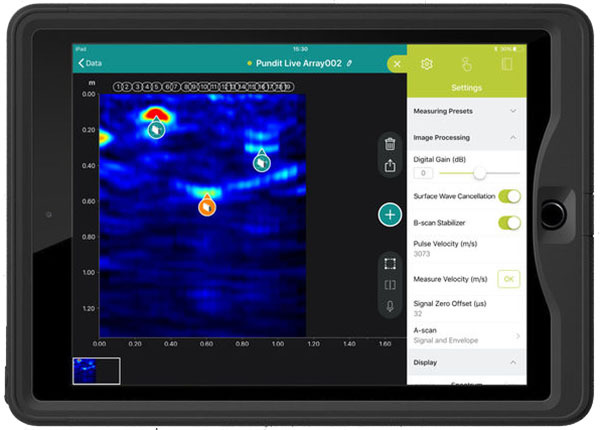 The Live Array Pro improves upon existing instruments by offering an expandable array with unique AI features, market leading ease of use with 2D and 3D data collection and imaging all right in the Pundit Live iOS app. Penetration can reach as much as 1 m depth or more. With the Live Array Pro the user has access to real time tomographic imaging, the fastest data collection of any array, with smart AI functions to recognise and assist user interpretation. The Pundit Live Array Pro is the most advanced ultrasonic pulse echo (UPE) tomographic array available. It is a uniquely visual sonic test for use with concrete. 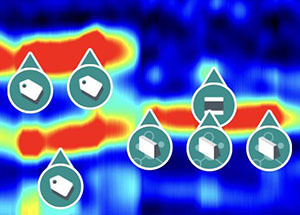 UPE Tomography is the ideal test for applications where the user is looking to determine an unknown measurement of the structure such as slab depth. 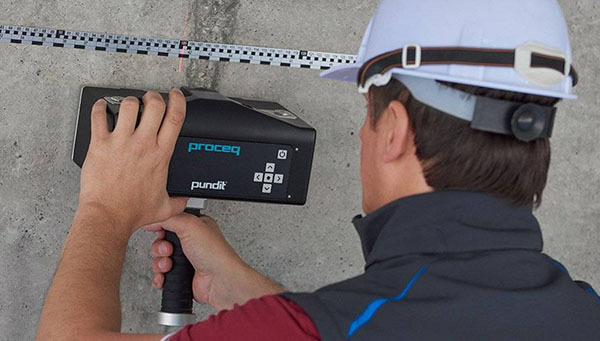 It is also uniquely suited to finding defects related to breaks or voiding in concrete such as poor consolidation, honeycomb concrete or delamination within large concrete elements. Fix the Proceq Live tape measure to the object you need to inspect. Scan wherever you want along the tape and get a perfectly stitched scan! Even if you realise you didn’t scan a spot, (shown as blank in the stitched scan) just go back and scan at that location and it will be placed correctly into the stitched scan. The Proceq smart positioning system uses a sensitive, fast CMOS imaging sensor and pattern recognition technologies to detect the position in real-time. Digital reporting, data sharing and back-up are possible directly from the Pundit Live app on iOS. The unique Logbook feature records the key parameters associated with each and every test including settings, time stamps, photos, site notes and geo-location. Reports can be sent directly from the iPad on-site and all measurements are accessible through Proceq's web platform all over the world. The Pundit live array will detect the back wall reflection within a scan, marking it with a back wall tag indicated in the image with a circles and lines background. They may be used to determine the boundaries of meaningful information for interpretation by an operator. Operators can add additional tags and adjust the position of the AI tags if required. With the 8 channel Pundit Live Array Pro measurement head, one channel transmits the ultrasonic signal and the echoes are received by the other seven channels. Each channel transmits in turn. A complete measurement consists of 28 A-scans. These are used to compute and display a B-scan in real-time using the Synthetic Aperture Focusing Technique (SAFT). Coupling two transducers results in a 16 channel aperture processing a total of 240 A-scans per measurement cycle. Stripe scans modes allow for depth-slice / C scan images and 3D reproduction. The Pundit live array supports data export from all measurement modes. Raw data is provided in a .csv format and is suitable for use in third party 3D or data analysis software for research or imaging during projects. The Pundit Live Array's iOS App allows immediate imaging of UPE data. This image can be shown in a conventional B Scan or C Scan format, or processed into a full 3D iso-surface representation onsite. The operator places the AI positioning tape perpendicular to the Pundit Live array and then moves it forward in a strip, collecting 3D data in the area underneath the array's motion. 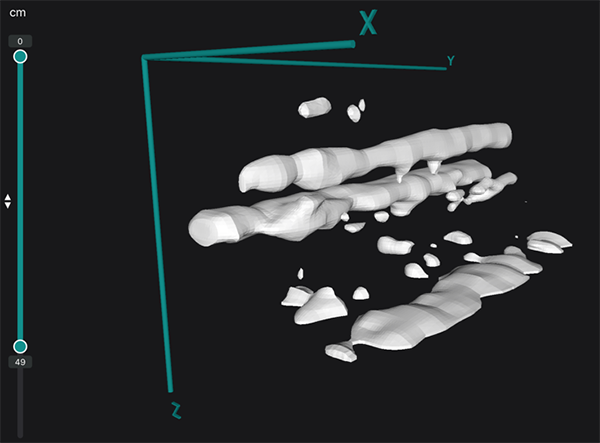 It may be shown as a Time-slice/Depth-Slice view, or as a 3D iso-surface. The operator places the AI positioning tape parallel to the Pundit Live array, moving it sideways along the structure producing one long Line Scan. The data may only be shown as a Line scan view. Line scan view is available with Line Scan or Stripe Scan data, when stripe scan data is collected any of the individual measurements in the stripe may be reviewed. In this view manual and AI tags may be used to mark features and back walls. Exports will include the image of the view as shown on the iPad display, and a .csv / Excel file with a list and details of the tags placed on the scan.The image above has been trimmed for space below 0.45 m depth, it shows a V shaped back wall test block with honeycomb concrete visible in the tag 20 position. 3D iso-surface view allows the operator to present a 3D visualisation of the internal features and back wall reflections of the structure. They may adjust the maximum and minimum depths presented, along with the intensity of signal presented in the 3D view. The Pundit Live Array app will record its geo-location during measurements and all the meta data relating to the array in use and the settings of the scan. 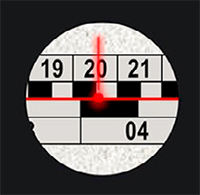 The operator may add to this written or audio notes & images relating to the scan. Any later adjustments to scan settings are also recorded. Each scan file has its own dedicated record.